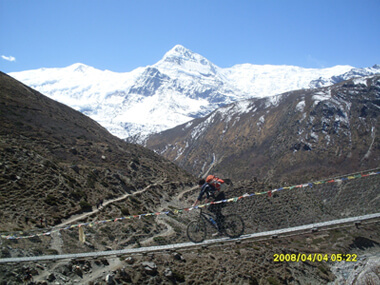 Nepal offers some of the finest bike trails on Earth! There are virtually millions of tracks out there. Some people have even started calling Nepal a "Mecca for Mountain biking." Until few years back, visitors came to Nepal mostly to trek, climb , raft or to see the Tigers in the wild. But now, a new sensation has begun.....mountain biking! Have you ever wondered how would it be to ride alongside some of the tallest mountains in the world? Or crisscross the hundreds of valleys, inhabited by the indigenous people whose lifestyle has remained unchanged for centuries, through terraced fields, rice paddies, rivers and jungles. This site brings you information about mountain biking in Nepal, the mystical place with 10 of the 14 tallest mountains in the world. See Nepal on a mountain bike. You will love it ! We at Annapurna Foothills Treks believe that bikes are the most versatile way of seeing Nepalese rural lifestyle and exploring "off the beaten track." Join us for a bike ride and we will guarantee you the highlights of your entire stay in Nepal. The commitment to start such a venture, maintain it and grow across the decades – jumping the hurdles & challenges of a developing country takes nothing less than a love of sport, adventure, the outdoors and a pinch of madness! Infomation of Mointain bike in Nepal Over the years since our pioneering year of 1988 we’ve maintained the vision of running the best tours available and endlessly searching for that great new trail that only Annapurna Fot hills Treks can offer. Our mission has been to share the unique & vibrant culture, colours, beauty and diversity that the Himalayan Regions offer to all those who choose to venture into its borders and trails. As we know there is no better way to explore the region than in tandem harmony of a well tuned self powered trail finding mountain bike These days Annapurna Foothills Treks Adventures has moved beyond just biking, as adventure of all kinds has exploded into the scene and so we now offer many realms of adventures including treks to unique locations, kayaking & rafting, paragliding, adventure races & events, team building & youth development programs, authentic village experiences and our own exclusive resort "The Retreat" in Pokhara. Kathmandu in the 1980’s was certainly still a time of innocence in Nepal’s history and not far removed from the hippy trail. In 1988 the spirit of adventure, beyond just trekking, was being realised and mountain biking as a new world trend was starting to fill the trails vacated by free spirited hippies. Nagarkot is one of the most scenic spot situated about 35 km east of Kathmandu from where an excellent view of snow-capped peaks of the Himalayan Ranges in eastern Nepal can be seen (if weather permits), as well as renowned for the spectacular sunrise. Namo Buddha is a Tibetan monastery situated on a hilltop east south of Dhulikhel. It is rarely visited by as there is no road for vehicle. Pilgrims hike to NamoBuddha but we do it on the mountain bike all the time. On the first day, we ride to Dhulikhel and stay in a resort. Enjoy the serenity of this hill village and explore the surroundings. Following day, the trail starts with a nice climb to Kali temple and gradually reaches NamoBuddha. After picnic lunch atop the monastery we ride back down to Dhulikhel and check into the resort. On the 3rd day, get ready for some off-road fun, which brings us back to Bhaktapur via the village of Nala. This tour is graded expert and requires good stamina. After the breakfast in the morning,we rides to Nagarkot via route Saku. Shaku village tour and we find different types life style. After reaching at Nagarkot, we will stay overnight there.Next day early in the morning, we will have an ample opportunity to observe fascinating mountain views (7,135ft) which includes Mt. Manaslu, Ganesh Himal and many others. We eat breakfast with sunrise views over the Himalayas. After we ride downhill leaving Nagarkot top to Nala other Newari Village. On the way we pass some interesting villages of Chetri and Bharamans people and their daily lives on the fields. Then we leave for Dhulikhel on a dirt trail climbing and descending small hill before reaching the holy Buddhist site of Namo Buddha. According to legend it was here that Buddha, in a previous incarnation, fed his flesh to a hungry tigress as an offering. A stone statue marks the site; there is an active monastery on top of the hil. We follow the picturesque view along tarmac and dirt roads back to Dhulikhel. We spend a night at Dhulikhel. Enjoy sunrise in the morning. Final day of ride passing ancient city of Panauti. This is less known town rarely visited by tourists. Indreswor Mahadev Temple in Panauti is the oldest surviving temple in Nepal, believed to be constructed in 1294A.D. Climbing west; we follow small track along the Roshi River. Beyond the town of Madhuban, we enter into a narrow pristine valley ascending 300m on superb trail to reach the summit of Lakhuri Bhanjyang. This is probably the oldest route east out of Kathmandu Valley, connecting the ancient cities of the valley with Panauti. The ethnicity of the people change as we descend from Tamangs, Thakuries and Chhetris to lowland Newari farmers. We then cycle the last part of our journey from Sisneri to Kathmandu city with short visit to Patan Durbar Square. 01 Nepal mountain Bike tour Kathmandu – Bhaktapur – Nagarkot. A long day of uphill road rides though the pine forest brings us to a hilltop at 7133 ft above sea level. We call it Nagarkot, a place to re treat to from the hustle and bustle of Kathmandu, a great place to view the mighty Himalayan peaks, or just be ourselves. First, we visit the traditional pottery Newar pottery village of Thimi on our way to Nagarkot. A lunch stop at Bhaktapur, the ancient city dotted with 16 and 17 century monuments will bring you back to the Malla dynasty. We spend the night at Nagarkot in one of the many fine hotels and wake up to have breakfast with some of the 7000 and 8000 meter such as Langtang, Ganesh Himal,DorjeLakpa, GauriShankar and even Everest from a distance. We stay overnight at Nagarkot. We ride down the ultimate downhill trail for nearly 10KM to Sankhu, another ancient at the outskirts of Kathmandu. We visit BoudhnathStupa, probably the largest Buddhist Stupa in the world, and enjoy some local delights at this township. This tour is graded moderate and is suitable for anyone who has good stamina. We cover a distance of 65KM in this tour.